Over the weekend, conservative websites like Breitbart.com and Michelle Malkin‘s site attacked retired astronaut Mark Kelly, husband of former Congresswoman Gabby Giffords, over his recent purchase of a used AR-15 assault weapon. On Monday afternoon’s The Situation Room, Kelly told CNN’s Wolf Blitzer why he purchased the gun, and said he didn’t “know anything about who Breitbart is, or anything about his website,” and that he planned all along to buy the weapon, and post about it on Facebook. The “stir” that Wolf Blitzer referred to is the suddenly-keen-on-gun-tracking conservative blogosphere. On Saturday, Breitbart News reported that Kelly purchased a .45 semiautomatic pistol and a used AR-15 at a gun store in Tucson last week, then posted a message about the purchase on Facebook. The site heavily implied that Kelly only made that revelation on Facebook, and his decision not to keep the weapon, because Breitbart News was asking around about it. Blitzer asked Kelly about that implication. “What are you going to do with the AR-15?” Blitzer asked. It’s ironic that pro-gun conservatives are willing to inform on a gun owner in great detail, even as they oppose any and all collection of gun data that could be used to reduce gun violence and solve crimes. 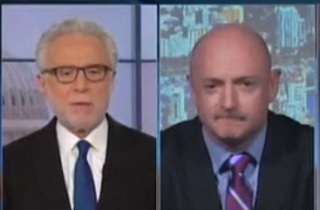 That they would jump to attack Mark Kelly is telling in a different way. Follow Tommy Christopher (@TommyXtopher) on Twitter.